Azrael bids the Mutanimals goodbye, as she has to return to her post as the guide for the final Path of Four Winds. Man Ray asks Kid Terra how he had been captured by Null. The cowboy explains that he had done as he’d promised (back in Mutanimals #1) and cleaned up the toxic waste dump that Null had created on the floor of the ocean. After the hard work was finished, Kid took a vacation to Aruba to decide what to do next, where he was drugged and kidnapped by the devilish Null. Ray decides to visit the Glublubs and tell them that their ancestral homeland is safe to return to. When Man Ray arrives, he notices a shadowy figure in the ruins of Null’s old vessel and investigates. 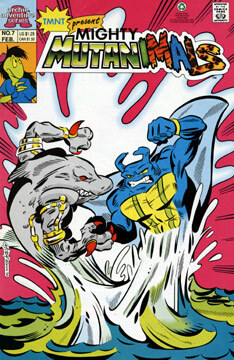 As Ray searches, he’s clobbered from behind with an iron girder by none other then the evil shark-mutant from the future, Armaggon. The shark-man wraps the girder around the unconscious Mutanimal and goes about salvaging parts from the remains of the ship. Suddenly, Merdude arrives and attacks Armaggon. The villain gains the upper ahnd, but a brave Glublub rides a ray into the fray and distracts Armaggon long enough for Merdude to get the drop on him and knock him out. The fishy mutant then revives Man Ray and the pair make their introductions to one another. Soon thereafter, Man Ray notices that there are numerous sharks circling ominously above them and their Glublub allies. Armaggon orders the man(mutant? )-eaters to attack as the Glublubs flee in fear. Man Ray grabs his foe and smashes him into a sand dune, but he gets bitten and then smashed with the girder once again. As Ray slumps in pain, Merdude chases Armaggon, who is trying to escape via a timeslip portal. Unfortunately for the fishy one, rather than preventing the villain from escaping, he gets pulled through the gateway just as it closes. Ray calls out in vain as the portal disappears from view. Later, Ray returns to the spot where the rest of the Mutanimals are and meets Mondo Gecko. Mondo is excited because he’s found a shark’s tooth while combing the beach. Ray pulls Armaggon’s teeth from his side and gives them to his younger teammate and walks off sullenly.